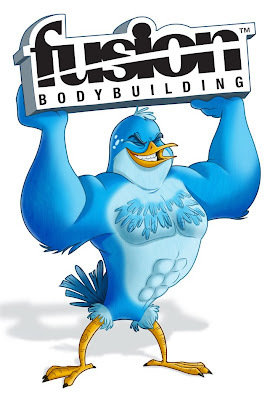 I was recently approached by Fusion Bodybuilding to create a custom illustration/character for their Twitter page. The Twitter bird has really been hitting the gym hard. Enjoy! he should be concentrating on his legs a little more. Ben ren, which way to the beach? Man this guys gotta go to the vet, those pythons are sick! Nice drawing Dog face killa. Love it. Hey Benz, that's awesome!! Is that where you go bodybuilding?? Thanks for your last comment:) Yasmeen will be here to visit this weekend, so we're really looking forward to that. Niish blog. I spotted Stoked designs down there! Tubular. Hey...Thanks for all he nice words Brotha! Where are your posts? You must be busy with the new gig. Drop me a line. Take care. A bird with a six pack, there's something you don't see every day. He's awesome!... and it's all your fault. I really love your work.very inspiring.I'd love to learn how do you come across creating a great art like yours. If you have a chance ,please check it out and leave a comment telling me what you think. Looks Awesome.You've got great stuff! Hey, If you have time to stop by my blog please do and drop a comment and tell me what you think! ha! nice job. congrats on the gig.